My plan was to get two kittens, siblings, so they could run around together. I didn’t want to browse for kittens, however, because that would make me cry and then I might end up with twenty kittens instead of two. I was waiting until the time when the kittens would appear in my path. One day, when I went shopping, there was a young entrepreneur outside the Food Pavilion holding up a cardboard sign about selling kittens to fund his trip to New York. He was hard selling these kittens. I had a peek at them and went in the store all the while texting the kids about the kittens and thinking I’d better hurry up and get back out there to get them. These kittens were crossing my path, it must be divine intervention. When I got back out I went over to the kittens again. Two left. One fluffy tiger-striped and one black. Another woman and her three small children were also looking at the kittens and the kids really wanted one and were leaning toward the striped little beast. “Can we get one?” the kids asked her. “We have to call Daddy, we could use the pay phone.” she told them. When she asked which one I wanted I told her I would take them both if she didn’t want one. She said she had to call her husband first so I said I would wait. I told the kid I would be right back and went to unload my groceries. When I came back I saw the woman on the pay phone. At the time she mentioned the pay phone I thought it odd and cool at the same time that she didn’t have a cell phone. Then there she was on the pay phone, for real. When she got off the phone said she had to go home to get money and would be back. I gave the kid his trip money and took the black kitten. On the ride home she walked around and kept trying to get on the floor by the foot pedals. It can be a challenge to drive and shift and stay on the road while a kitten is climbing all over the place. Perhaps it was divine intervention that kept me from driving off the side of Highway 9. 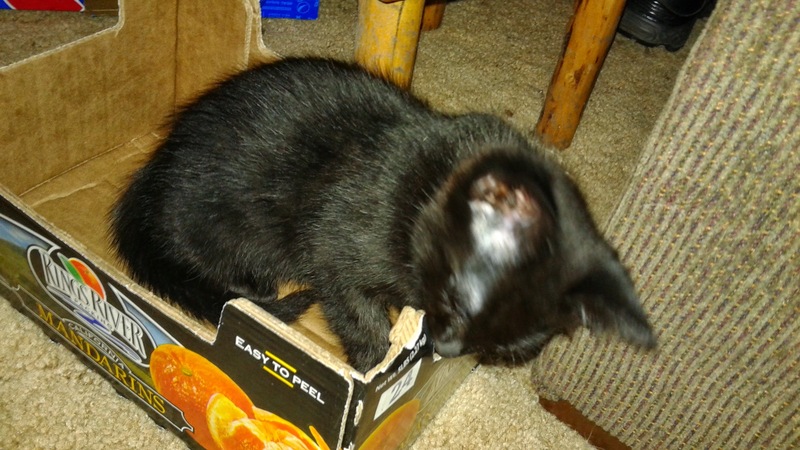 A few days later we stopped at the farm supply store to get a small plastic litter box since DC (the little black kitten) wasn’t using the shiny metal aluminum pan box. On our way into the store there was a car with the back hatch open and full of free puppies. The workers were hard selling these free puppies. “You just don’t find free puppies this good,” they told us. As we walked by I looked at the puppies but kept walking, following Liza into the store. 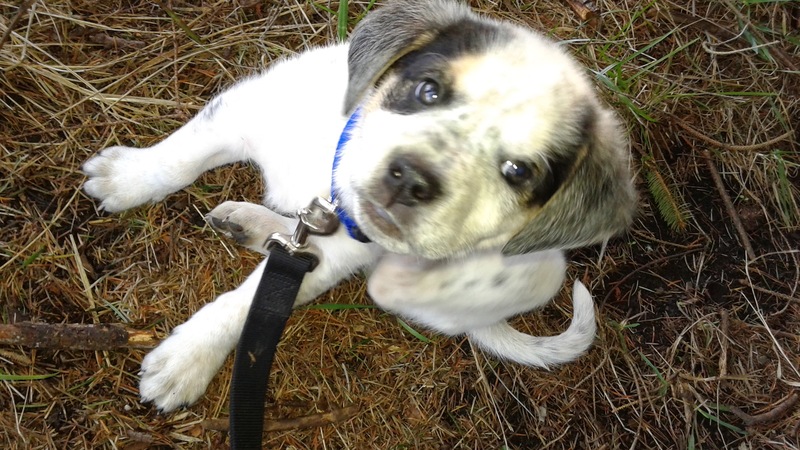 Several people mentioned that we should get a puppy. There was a puppy sitting on the counter with one of the workers. I asked it if was the demo puppy. On our way out Liza went ahead to the car and I ended up over by the puppies. The man holding a small black puppy asked if I wanted to hold him since his arm was getting tired. 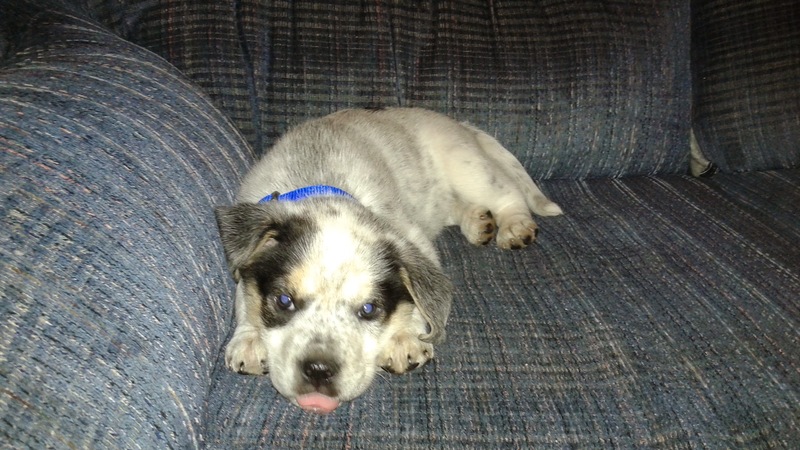 He also had with him the mother of the puppies, a Catahoula leopard dog. Liza had almost made it to the car when she turned around to see me holding a puppy. Resigned, she returned to the car full of puppies. NO, she said. NO PUPPY. No more animals. We can’t afford it. No. “We can do the shot here,” said one of the workers. Then Liza was looking in the side window and saw the white puppy with some black spots on the bottom of the puppy pile looking at her. “I like that one,” she said, pointing through the window. She wanted to hold that one since he was cute and seemed to be the biggest and laziest puppy. I put the black puppy down and held this big lazy puppy instead. You decide, she told me. So, I decided to put the puppy down to see what would happen. Would he look at us? Then several other people seemed interested in him and Liza mentioned I had better pick him up again. Then we both wanted the puppy. Back into the store we went to get puppy supplies. It really didn’t cost that much and it seemed meant to be that he crossed our path. After much deliberation we settled on calling him Max. Now we are wondering which item he will destroy first. 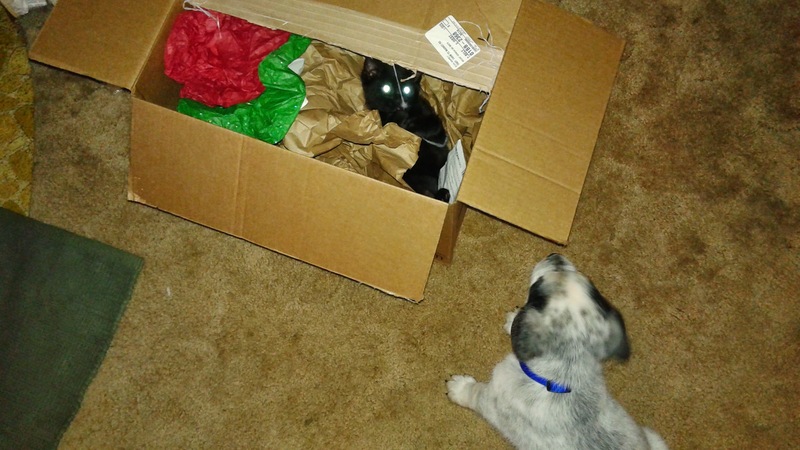 This entry was posted in animals and tagged animals, black kitten, divine intervention, fate, kittens, puppies. Bookmark the permalink.